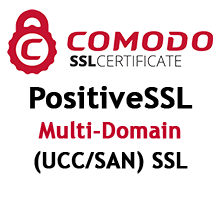 If you need a fast way to protect multiple domains in a single SSL certificate, then Comodo Positive SSL Multi-Domain (PositiveSSL) is a good choice. Comodo Positive SSL Multi-Domain comes with high-quality protection and quick domain verification, does not require documents, is suitable for individuals and organizations. This certificate with a 256-bit level of encryption also has full browser compatibility and is issued within three minutes. Multi-domain certificates, such as Comodo Positive SSL Multi-Domain, also called SAN certificates, provide full control over the alternate name field. Comodo Positive SSL Multi-Domain is ideal for protecting several domains in different domain zones and subdomains (for example, in Exchange). You also have the ability to add, change, and delete any domain on the fly to reflect the changing needs of your network or system. Comodo Positive SSL Multi-Domain does not have such a wildcard function. Wildcard SSL certificates protect one domain and all subdomains of this domain. If you need to protect all subdomains (for example: ftp.yourservice.com, mail.yourservice.com, etc. ), please review the wildcard SSL certificates. If you need to protect only a few subdomains, then it is cost-effective to take several single-domain SSL certificates. Comodo Positive SSL Multi-Domain is well suited for a personal site. For individuals, organizations, enterprises. Obtaining an SSL certificate Comodo Positive SSL Multi-Domain occurs after domain ownership is confirmed (via email, file on the site, or via DNS). To get the SSL certificate Comodo Positive SSL Multi-Domain you must confirm that you own the domain. Since no documents are required, SSL certificates with domain verification, such as Comodo Positive SSL Multi-Domain, are the most popular SSL certificates in the world. The Comodo Positive SSL Multi-Domain SSL certificate is issued instantly as soon as the certification authority Comodo successfully verifies domain ownership rights. Verification of documents and a call to the phone are not required. Comodo Positive SSL Multi-Domain does not have the "green bar address" option (extended validation). Extended validation SSL certificates are the most prestigious. Sites with such SSL certificates are displayed in the browser against the green line with the name of the organization. Please note that an SSL certificate with extended verification is issued only to the organization or to the enterprise. Regery has a large selection of SSL certificates with extended verification. Repeated free reissue allows you to change SSL certificate settings Comodo Positive SSL Multi-Domain at any time. Obsolete mobile phones, browsers in them may not recognize that the SSL certificate Comodo Positive SSL Multi-Domain. All new phones and mobile devices are already working with Comodo Positive SSL Multi-Domain. Comodo Positive SSL Multi-Domain can protect an unlimited number of servers. Free support www. Provides HTTPS-protected access to www.mypages.info and mypages.info sites. Company documents are not needed, only verification of domain rights (through a file on the site, by mail, by DNS). The process of verifying the SSL certificate Comodo Positive SSL Multi-Domain is performed online, so you do not need to worry about the paperwork. It is easy and convenient. SSL certificate Comodo Positive SSL Multi-Domain uses 256-bit encryption with one root certificate. The perfect solution for a website, blog or service. With the purchase of an SSL certificate Comodo Positive SSL Multi-Domain, the certificate authority Comodo will be provided a guarantee of $10,000. Compensation of the damage caused is paid to the end user of the site or to the victim of fraud in the event that the fact of breaking the HTTPS connection, which was established using the original Comodo Positive SSL Multi-Domain, is proved. Warranties focus on protecting your customers and to increase the level of trust to your website, emphasizing to users the security of their presence on your service. The Comodo Positive SSL Multi-Domain SSL certificate comes with a 15-day money-back warranty. Thus, you have time to fully check the SSL certificate on the site. You can buy an SSL certificate Comodo Positive SSL Multi-Domain, try it and get a refund if it doesn’t work for you. Please note that most paid SSL certificates are generally available for FREE. You do not need to pay anything, you do not need to specify a card, and you also don’t need to contact support services - everything is automatic. Regery services will automatically cancel such certificate, if after the creation of the SSL certificate payment does not come to the company. SSL certificate Comodo Positive SSL Multi-Domain comes with a free static site seal. You can place a seal anywhere on your website that customers see that they are at a safe resource. Static site seal can be quickly and easily installed, on the seal does not show further information about checking, related to your web site or service.